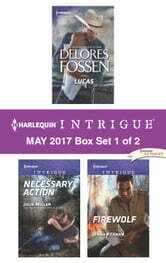 Harlequin® Intrigue brings you three new titles at a great value, available now! Enjoy these suspenseful reads packed with edge-of-your-seat intrigue and fearless romance. Texas Ranger Lucas Ryland knows his ex, Hailey Darrow, would only come to him if she had no other choice. And this time she and their newborn son are both in danger. Detective Tom "Duff" Watson and Melanie Fiske both want justice, and his investigation into an arms-smuggling ring in the Ozarks may be the key to solving her father's murder.Can they succeed with the secrets held between them—and the desire? Filmmaker Meadow Wrangler would have burned alive if not for Apache hotshot Dylan Tehuano. When he comes under fire for arson and manslaughter, Dylan and Meadow will have to work together to stay ahead of the heat. Look for Harlequin Intrigue's May 2017 Box Set 2 of 2, filled with even more edge-of-your seat romantic suspense!